On behalf of our family at Tavaputs Ranch, it would be our honor to welcome you through our historic gates where lifetime memories are made. 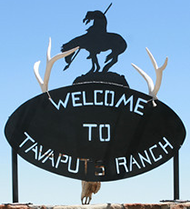 Tavaputs Ranch is located high on the Tavaputs Plateau in remote Eastern Utah. If you're driving in, take I-70 to Green River, Utah, and look for the State Highway 6 North exit. Our landing strip allows fly-ins to reach Tavaputs Ranch from Utah airports in Salt Lake City, Price, Green River, or Moab. In Colorado, your best bet is Grand Junction.